¡¡ Una maravilla para vuelo con motor y sin motor !! LK8000 is a Tactical Flight Navigator for gliders, paragliders, hang-gliders and general aviation. It is a consolidated open-source project born in 2010, available on most platforms: PC, PNA, KOBO, LINUX, IOS (under development), RASPBERRY and ANDROID. LK is translated into 17 languages and used in over 67 countries by many thousands pilots every day. LK can be configured to act as a navigator for free flight (gliding, paragliding, hang-gliding), for light aircraft (general aviation), and also for trekking and offroad! On our website you can download the necessary maps for your country, together with documentation, hints, tutorials and news. We also offer free support to all users on our international support forum (upon free subscription). Maps can also be downloaded from LK configuration using LKMAPS app. 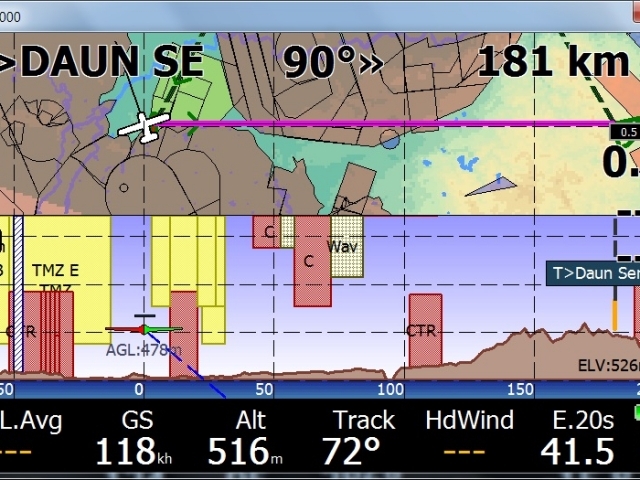 - Forecasting for completion of FAI triangles, with virtual waypoint created dinamically and available for a "go-to"
- A super complete automatic logbook, both for reading on the device and for export as CSV for spreadsheets. - A super aggressive FLARM data management, with "link to target" functionalities, radar with history of traces and more. It is the most advanced FLARM data management available worldwide in terms of capabilities. - An innovative "visual glide" page, suggesting all reasonable choices for long glides around with no need to touch anything, totally automatic: just feed LK with data (waypoints) about mountain peaks, valleys, ridges. - Automatic MacCready calculation (AutoMC): let us tell you how things are really going, and calculate arrival altitudes not around what you hope, but what you are really doing. - Multi targets: change destination with a single touch of the screen corner, rotating among current task waypoint, best alternate (calculated automatically of course), Home, Last good thermal, Team mate, Flarm target. - Textual list and selection of all of your thermals, for a prompt go-to, automatically named after their timestamp, with distance and direction from you, historic climb average and forecasted arrival altitude at the bottom of the thermal, all sortable, and ready for a go-to . Watchout, LK8000 has been carefully designed for a turbulence proof usage during flight. It is trivial to use it, but not immediate without knowing how it works. Once you know it, you never leave it. Feed LK with waypoints. On ancient hardware, we made LK capable to handle as much as 10 thousands waypoints at once. On modern systems, it would be a pity not to make use of hardware speed. If you fly in mountain areas, look after a waypoint list of peaks, valleys, ridges, thermal spots, and let LK use them for you. You will be amazed for what appears automatically on the multimap page "Visual glide" once there's some data to munch! Rock solid. LK is your personal flight assistant for tactical decisions, and you wouldn't expect it to drop you out after a software crash, would you? Stable versions are released only after an intense beta-testing phase carried on by hundreds of test pilots around the world. What you get, is the most advanced free flight computer ever made. Welcome aboard! ¿cuales son las diferencias entre lk y xcsoar?? o por que te gusta mas el lk?? Buenos dias, ¿está desarrollado ya para IOS? Gracias. El LK8000 está también preparado para vuelo con motor, como los ultraligeros. El XCSoar sirve, pero le faltan algunas funciones típicas para aviones, como la escala de grados en pantalla, colores de terreno según el nivel de vuelo, etc.